For the upcoming gig, with my cover band Power Hell at Microsoft Techdays 2014 in Stockholm 19/11 – I will try to eat my own dog food as an e-drummer. I will enter the stage with a Microsoft Windows 10 based Surface Pro as the e-brain for generating all the drum sounds! So – Why using a Surface Pro? I am a user of a Surface Pro (V1) system since 1.5 years and also an e-drummer. After year’s of using different notebooks in my drum setup, I came up with the idea to use a Surface Pro as the heart of my e-drum solution. It fits very nice behind drums and it also delivers fast and raw sound power. Something which is harder/impossible to do with for an example an IPad. (The e-drum apps are not so advanced and they don’t offer the right sound quality etc). The PC-based drum-plugin software which I am using on the Surface is Addictive Drums from a Swedish company named XLN Audio. XLN have recently updated their plugin to support touch based devices (A nice solution if you mainly have two drumsticks in your hands) and together with about 50 GB’s of drum samples to choose from – I can just say that the freedom is more than great! When I first came up with my idea and started to test the Surface Pro – the initial tests was on Windows 8. Compared to my older systems with Windows 7 – I realized that something had changed in Windows 8.x because the latency (the time from hitting the drum until a sound is generated) had got to an extremely low level compared to Windows 7! //Anders Gronlund – a Microsoft Partner and e-drummer in Power Hell. A USB based 8 channel sound card from M-Audio. The e-drum software Addictive Drums from the Swedish company XLN Audio, about 50 GB’s of drum samples with a touch aware GUI. A analogue to electronic converted drum set with piezo sensors and mesh heads. Some e-cymbals and a e-hi-hat. 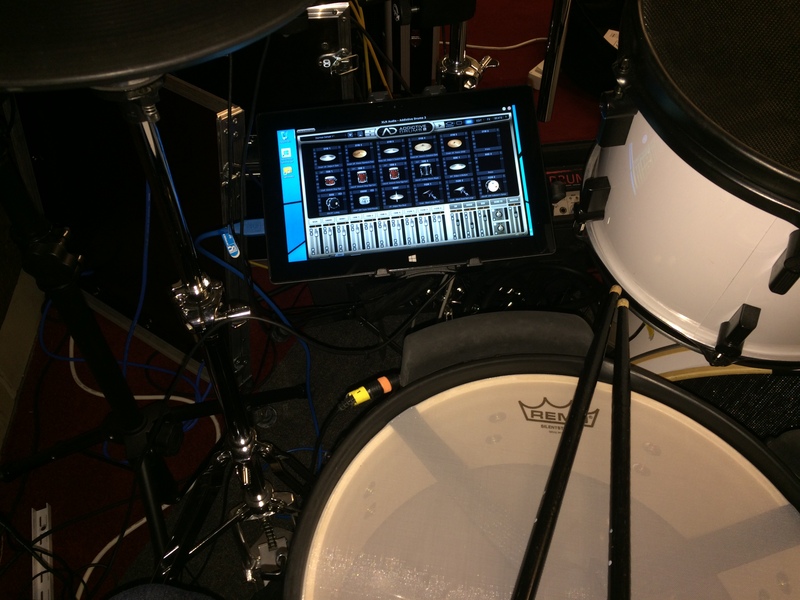 Attached is an older movieclip when just fooling around behind the drums…using the Surface Pro!